Last month, I struggled with incorporating a very heavy metal clothespin into my project. This month, it was the cupcake topper that really challenged me. That and the fact that none of my quotes had any of the same colors as the topper. Then there's the stencil. A snowflake stencil would be easy for a winter project, but there are no winter colors in any of the other items... and besides, this is June! As I played around with the frame, I realized that the opening was the perfect size to hold a gift card. I popped a Baskin-Robbins gift card into the frame, then noticed that the pink of their logo matched one of the dimensional quotes I needed to use. I cut down the quote from "Enjoy your life" to just "Enjoy" and started playing around. What if I used the blue of the logo to paint the frame, then used just part of the snowflake stencil to stamp in pink? That would have more of a summery tropical feel instead of a wintery snowflake feel. It took awhile to mix the perfect shade of pink and to decide what part of the stencil to use as a stamp, but with three items used, the project was definitely coming together. When the gift card is removed, the recipient can use it as a frame. I'm not crazy about this project, but it really pushed me creatively which is always a lot of fun. I haven't stamped with stencils in ages; that's a technique I need to use again. To see what the other designers made, head over to Flamingo Scraps. As usual, the projects are all very different from one another! The prompt for Day 5 of Kidding Around suggested photographing your favorite summer footwear, drawing by holding a marker between your toes, and/or designing a new type of shoe. None of those really appealed to Trevor, so we chose to do some footprint art. Trevor decided to make two footprint critters - a ladybug and a bee. I helped him trace his foot, first on red cardstock and then on yellow. 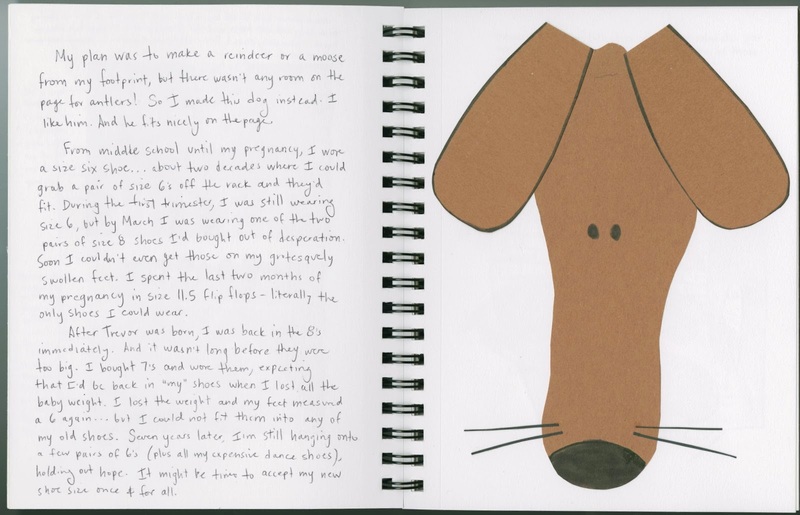 He cut out both shapes, glued one to side of the notebook, and then used a black colored pencil to add details. 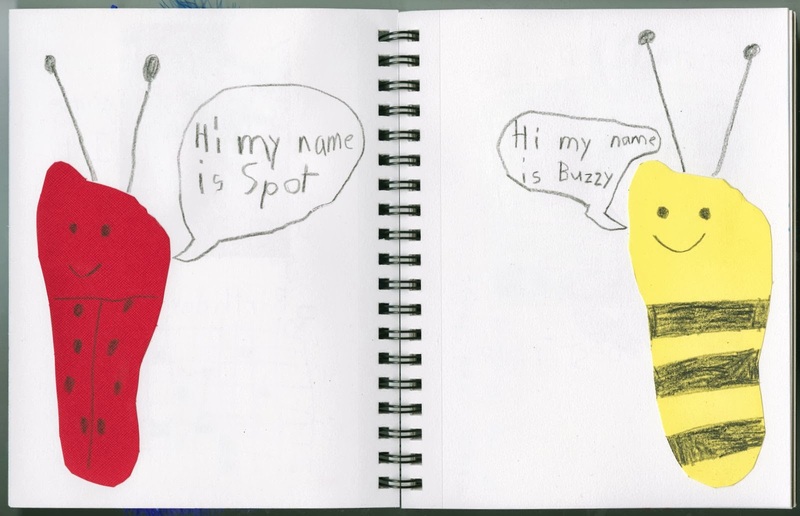 Finally, he used the same colored pencil to add speech bubbles. I wanted to make a moose or a reindeer. I got out brown cardstock, traced my foot, and cut it out. Immediately, I noticed a problem. My foot was not much smaller than the 7" x 10" notebook. There would definitely not be room for antlers. My planned antlers became the floppy ears of a dog. I colored his eyes and nose with a black marker, then cut tiny strips of black cardstock to use as whiskers. 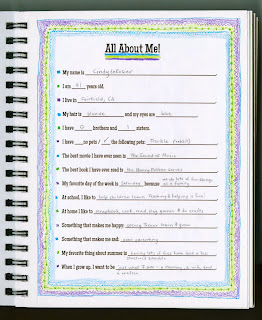 I used the facing page to journal about my feet. The fact that I couldn't fit a moose on the page reminded me of the (literal) ups and downs my feet went through during and after pregnancy. For about 20 years, my feet were a perfect size 6. It was extremely convenient. And then, at age 33, I got pregnant and my feet started to go up, up, up. By the 7th month of my pregnancy, due to severe edema, I literally could not put my feet into anything but flip flops.... size 11.5 flip flops. By month 8, even those were leaving marks on my feet. I avoided shoes whenever possible. 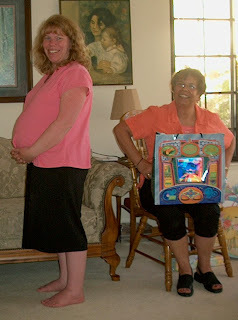 Here I am at the baby shower my coworkers gave me. I didn't wear shoes. I'd been briefly hospitalized for severe edema by this point and was ordered to sleep with my feet elevated 30 inches. (Measure it - and then try it. It's ridiculously difficult to sleep like this.) I would wake up 6-8 pounds lighter in the morning than when I went to bed and my feet were noticeably smaller. But an hour into my day and my feet were bulging out of their size 11.5 flip flops. When I gave birth, my feet shrunk down so rapidly that I couldn't wear any of the shoes I'd bought during the pregnancy without them falling off... nor could I get into my pre-pregnancy shoes. So frustrating. Now, 7 years later, my feet measure a size 6... and I still can't get them into my old shoes. Or any size 6 shoes. I have them measured a couple times a year and they are definitely a 6, but I can't squeeze my feet into anything smaller than a 7, and usually a 7.5. I've long since given up hope of getting back into my pre-pregnancy shoes, with the exception of a closet full of very expensive ballroom dance shoes that I haven't been willing to get rid of. 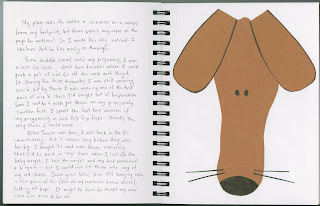 Doing this journal page made me realize that it is time to accept that my feet will never be what they were before the pregnancy and that it is time to give away all my ballroom shoes. I never would have guessed that Kidding Around would help me acknowledge this body change and motivate me to let go of all of those shoes! Day 4 of Kidding Around was about board games. Yea! I love board games! The prompt said to take a picture while playing your favorite board game and then write about the game. Trevor's favorite game is one he just got for his birthday, Atlantis Treasure. It is a great game. Lego games are always fun because you get to build the board, but some of them aren't quite as fun to play as they are to build. Atlantis Treasure is even more fun to play than it is to build. The game is simple to learn, but there is a lot of strategy. Trevor is very good at it and usually wins, no matter who he plays. I struggled to choose a favorite game. There are at least 20 that I LOVE and would play over and over and over. We have three board game areas in our house (each with dozens of games)- one downstairs in the family room, one upstairs in Trevor's room, and the largest upstairs in our bonus room. Because we were downstairs playing Atlantis Treasure, I picked my favorite downstairs game for the assignment. No question - it's Labyrinth. Labyrinth has the perfect balance of luck and strategy, is easy to learn and fun to play. It's a different game every time, as the board changes with each person's turn. I added a picture of Trevor playing Labyrinth and a second photo showing some of the many board games in our bonus room. 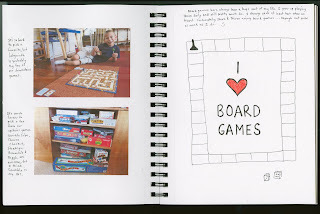 I listed some of my other favorites, including what I think is my #1 favorite board game, Scrabble. Remember last week when I mentioned that, despite playing board games together nearly every day of his life, I'd never introduced Trevor to Monopoly? When we finished with the Kidding Around assignment, I pulled out the Monopoly board and taught Trevor how to play. He LOVED it. We played for three hours before he went bankrupt. Trevor is a cautious person both in life and in game play (observe first, act when confident)... which doesn't work all that well for Monopoly. He chose not to buy properties at first, which meant that he was doomed to lose. When we played Monopoly again the next day, his strategy was completely different. He bought up everything he possibly could, erected as many houses as possible, and went on to bankrupt me. By the way, I'm experimenting a bit with monetizing my blog. I really don't want to put advertisements on the blog, so I'm trying out affiliate programs. Several of the links in this post are Amazon affiliate links, meaning if you click a link and buy that product from Amazon, I will receive payment. Obviously, I've only added links to products I use and recommend. 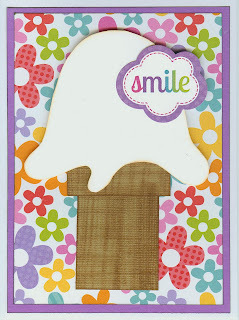 It's time to announce the winner from the Ideas for Scrapbookers Summer Blog Hop! Random.org picked lucky #4, which is MamaBirdy (Tanya) of Happiness is Homemade. Congratulations! You've won a $20 gift certificate for scrapbook.com. Thank you to all of you who hopped along! Tis the season... for a bumper crop of zucchini! I can't tell you how many times I've gone out back to check on our zucchini, decided none were *quite* large enough to harvest, then returned a day later and found a zucchini the size of a loaf of bread. Check out the zucchini that Trevor harvested the other day. We love zucchini, but there's only so much you can eat sliced and sauteed. I have a number of favorite zucchini recipes, but I'm always on the lookout for more. I've gotten in the habit of tagging awesome-sounding recipes in Google Reader. With the tragic demise of Google Reader coming up on July 1, I decided to go through all my tags and move the ones that still sounded awesome to Pinterest before they were lost forever. In the process, I found two zucchini recipes that I decided to try. First up, Zucchini Enchiladas. I followed the spirit of the recipe, though I reduced the garlic, replaced the scallions with minced onions, and used salsa verde instead of a red enchilada sauce with Greek yogurt. So basically, I sauteed a small amount of onion and garlic with a lot of shredded zucchini, added salt and pepper, mixed in cheese, and rolled it up in tortillas. I poured salsa verde over the top, sprinkled with cheese, and baked. Here's what they looked like going into the oven. They were delicious! All three of us enjoyed them. Not only do I love having another great healthy (and meatless) option for dinner, but these were the perfect make-ahead food. I prepared them in the morning, popped them in the fridge, and left baking instructions for Steve. When Trevor and I got home from baseball, the enchilada were bubbly hot and the whole house smelled fantastic. The second recipe was for Crustless Zucchini Quiche. I prepped this on the some morning as the enchiladas (might as well prep two dinners when everything is already out) and put them in the fridge for the following evening. I followed this recipe almost exactly. It smelled so good in the oven. And it came out looking beautiful. The enchiladas were really good, but this quiche was to die for! It was so good! Steve missed the crust, but I didn't. This was creamy and rich and full of flavor... not at all what you might expect for a dish that's at least 75% shredded zucchini. I could eat this all summer. It was so good, I might actually need to buy zucchini during the winter to make it then. Back to the topic of Google Reader. I still haven't fully accepted that it's going away. I would GLADLY pay a subscription to keep it, but unfortunately that is not an option. For the past few months, I've been trying out a few of the (lame) replacements that are out there, then ranting to Steve about how such-and-such is so much worse than Reader. Being the awesome husband that he is, he started researching options for me in the open source community and found CommaFeed. It's not Google Reader, but it's the closest thing I've seen. I'm still going to use Reader until the second they pull the plug, but after that it's going to be CommaFeed for me. What about you? What's your Google Reader alternative of choice? I recently spent a few days judging at a county fair as I do each summer. This year, I judged a wide variety of arts & crafts, upcycled projects, and paper crafts. It was inspiring, exhausting, fun, and often very hard. I carefully examine each and every entry, compare it against the scorecard, and take a lot of notes. I put a lot of thought into which item will get the coveted 1st, 2nd or 3rd and the cash prizes that do along with them. I leave constructive comments for each entry. My hand aches by the end of the day. I joke with my fellow judges that I wish I could have rubber stamps made with some of the comments that I have to write over and over. "Carefully remove all glue gun strings before submitting project" would be the first rubber stamp I'd have made. What I ACTUALLY would want it to say is, "Seriously... you spend 5 hours on a gorgeous project and don't spend 2 minutes removing glue gun strings?! What is wrong with you?!" Thank you for submitting your project. I have spent the last five minutes carefully inspecting it. There are some things I would like you to know, things that I can't fit onto the tiny comment area they give me on your scorecard. For the love of crafts, remove glue gun strings and visible adhesive. Workmanship is a huge part of the judging criteria. If I see globs of glue, tape runner mistakes, or glue gun strings, you probably aren't going to win, no matter how good your project is otherwise. If your card or layout is so sticky with adhesive errors that I can pick it up with one finger, you definitely aren't going to win. If I can tell that you have multiple pets because your project is covered with three colors of dog or cat hair, you are not going to win. Frankly, you're lucky your project was accepted in the first place, since the criteria says that all projects must be clean and ready to exhibit. Take the 30 seconds to remove pet hair from your project. Yes, there are points for creativity, but I only award them if the project makes me say, "Wow! So creative and unique!" I do not award points for "Wow! That is the weirdest thing I've ever seen and I'm disturbed that anyone thought to make it!" Shock value is not what they meant when they put originality on the scorecard. Along those same lines, I appreciate a well-made, unique greeting card. But if Hallmark doesn't make it, there's a reason. Inappropriate items aren't going to catch my attention in a positive way. I'm guessing you thought your project was clever, but it's actually more alarming than clever. It's not going to win. If your project is so fragile that breathing near it results in a pile of sequins dropping off, don't enter it. Use better adhesive or fewer sequins. Your project is handled at least 7 times during the course of the fair. I judge it fairly early in the process and I can tell when damage is due to poor construction vs. rare mishandling. When two items are neck-and-neck and I have to choose one, I check the backs, edges, seams, etc. of each project. If the back of one of them is a mess and all other things are equal, that will be the difference between placing and not placing. Sometimes I don't understand your project. I am a craft expert with a lifetime of crafting experience and more than a decade of judging experience, but I haven't seen and done it all. If your project is very unusual or you've put a unique spin on it that I might not realize, include a note to explain it to me. I appreciate the extra information. Try, try again. But take judges' comments into consideration. 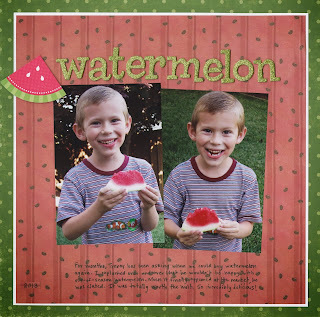 If you keep entering scrapbook layouts and the judge keeps writing on the comment card that they lack a focal point, learn what a focal point is and incorporate one into the next layout you enter. As judges, we want you to improve and we do our best to let you know what would make the difference in your project. Sometimes, there are a lot of awesome things entered. s much as I love them all, they can't all win. I really agonize about this and I wish there were a way to explain to you that this very project that doesn't place this year could have gotten Best of Class last year You never know what the competition will be like. Please keep entering because you are so talented. The assignment for Day 3 of Kidding Around was to gather up a wide variety of art materials in your favorite color and create. Trevor started by writing the word blue in pen, then thought of things that could be blue for each letter of the word blue (bat, lollipop, umbrella, easter egg). 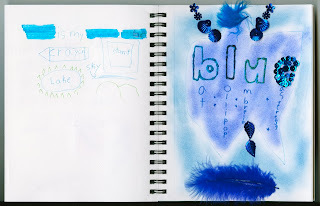 He chalked the page with two different shades of blue, then filled in the letter e with blue sequins. He added larger sequins and blue feathers. Finally, he outlined the letters b, l and u with three different shades of blue Stickles. 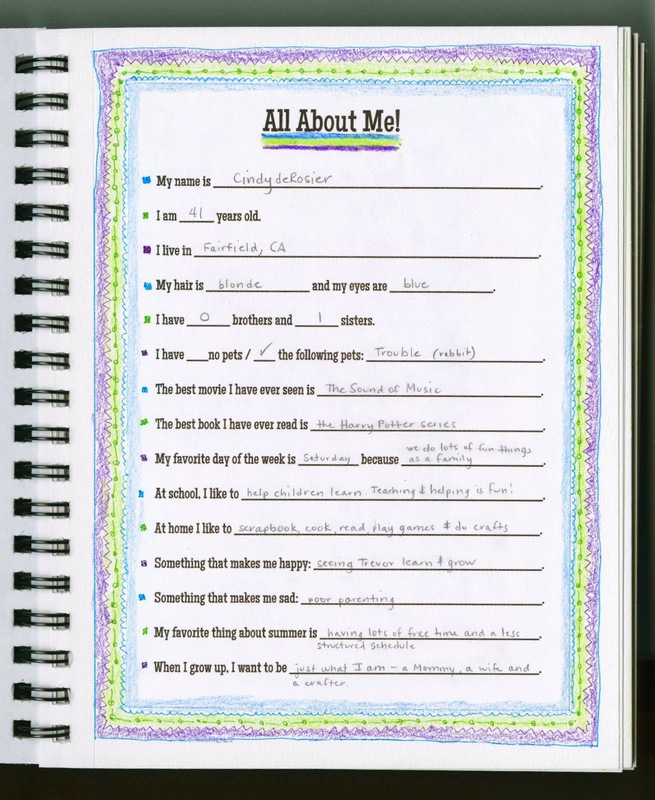 On the facing page, he listed other things that are blue. I don't really have a favorite color. When pressed, I usually say green or blue. Trevor encouraged me to select green, since he'd already claimed blue as his favorite color. So I did. 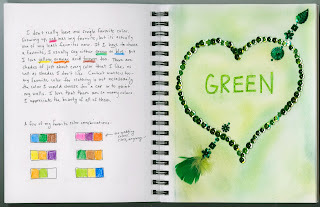 I wrote the word green in pen, then chalked the page with 4 different greens. I used sequins and feathers to make a heart and arrow around the word, then used one shade of Stickles to fill in the word. This was a lot of fun. I'm so glad that I'm playing along with Trevor's assignments! 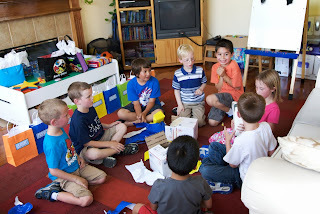 The assignment on Day 2 of Kidding Around was to make your own popsicles or ice cream. Trevor chose to make ice cream. I keep half-and-half in the freezer so that we can make ice cream on a whim, so we pulled it out to defrost. Trevor noticed raspberries in there and decided he wanted to make a raspberry ice cream. 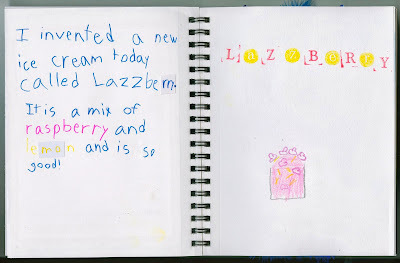 Then he noticed lemons on the counter and announced that we'd be making a raspberry and lemon ice cream... lazzberry ice cream! Here's our finished ice cream. The ice cream itself was pale pink with yellow flecks. We added raspberries and more lemon zest to the top. Trevor was SO proud of his creation. Even before he tasted it, he was convinced it would be the best ice cream ever. The verdict? Two immediate thumbs up! 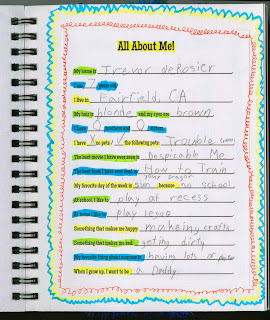 Here's the journal entry Trevor did. He was in a bit of a rush with the writing and made some spelling mistakes in pen. I showed him how to cut a scrap of paper to cover the mistake. Here's my journal entry. 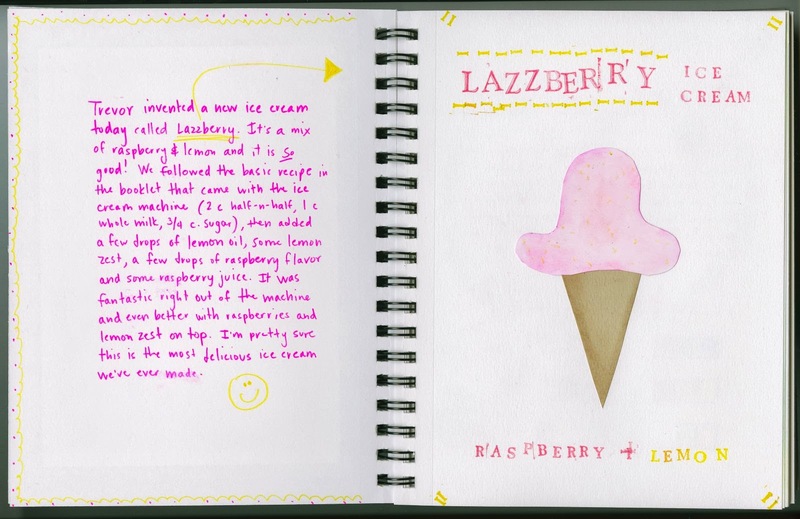 The recipe is in my journaling so that we can make this again. 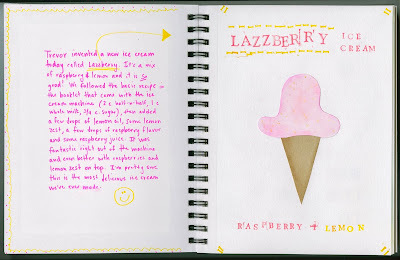 Lazzberry ice cream is SO good! Two days in and we're loving Kidding Around! Last summer, Trevor participated in Candice Stringham's online Summer Photography Camp for Kids. Each day, there was a lesson and an assignment to practice the day's skill. 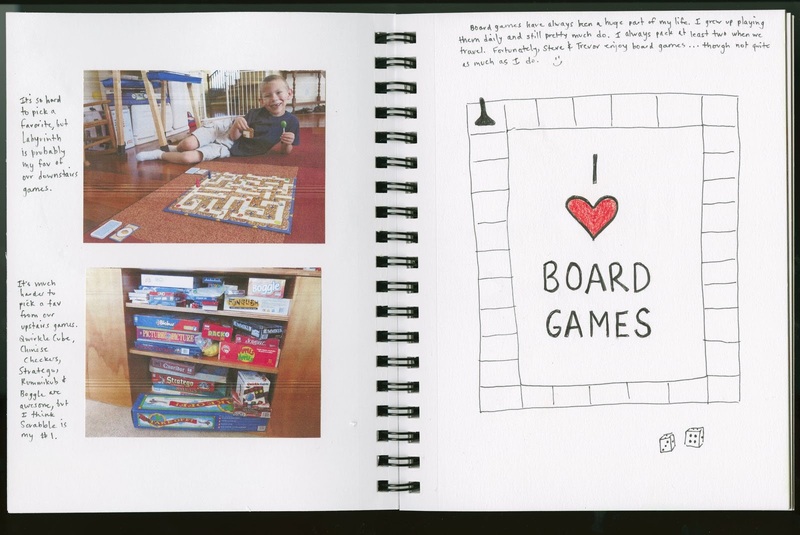 The children uploaded their photographs to an online gallery and left comments for each other. It was absolutely wonderful. I loved it, Trevor loved it, and we both learned a lot from the class. A few months ago, I contacted Candice to see if there would be a Part 2 to this camp. Alas, no. While the same camp would be repeated this year, there would not be a new version for returners. As much as we loved last year's camp, it didn't make sense to repeat the same exact class, so I went hunting for a different online class for Trevor to take. I found a class by Tami Morrison called Kidding Around that sounded great. 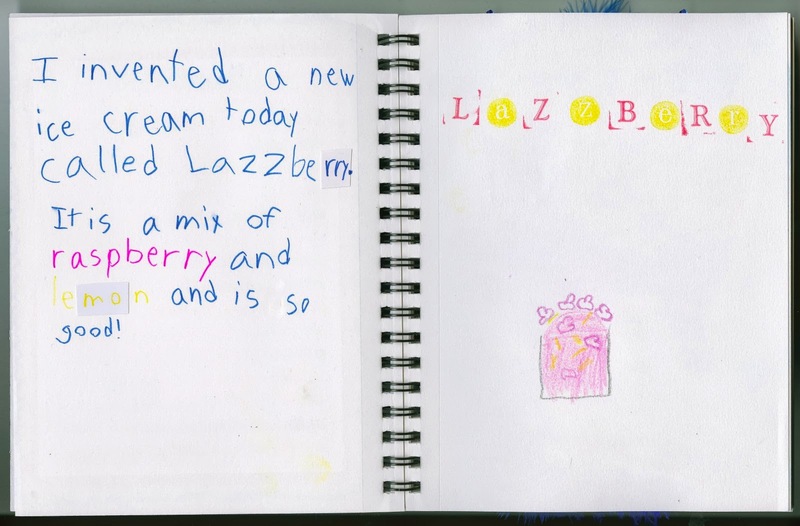 The children would receive prompts to do 20 activities, each of which would be recorded in a mixed-media art journal. Fun! By happy coincidence, the incredibly generous Karen Poirier-Brode had recently given me a gift certificate for $25 at Big Picture Classes and this class cost exactly $25. I signed Trevor up. I absolutely love that something that makes him happy is 'makeing crafts' and something that makes him sad is 'getting dirty.' Yep, that's Trevor, all right! I also love that when he grows up he wants to be a Daddy. Something that makes me happy is watching Trevor learn and grow. Something that makes me sad is poor parenting. When I grow up, I want to be just what I am - a Mommy, a wife, and a crafter. Tomorrow I'll share Day 2 of Kidding Around, where we made our own ice cream. Under the directions "Color these squares the colors that you like" I colored in red, yellow and purple. Under the directions "Color these circles the colors that you don't like" I colored in brown, blue, and green. Fascinating! 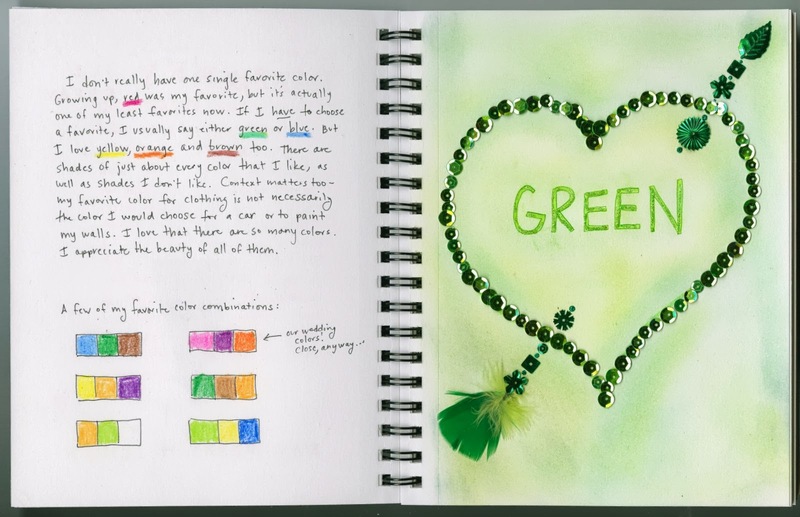 At 41, my favorite colors are blue, green and brown, the very colors I disliked at age 7. I still like yellow, but I don't really like red or purple all that much. While I remember disliking brown as a kid, I don't remember ever disliking blue or green. Or liking purple. Here's a page about foods and games. In 1979, I said that I don't like to eat pepper, salt, broccoli, 'tamtoes' or 'poetatoes.' I'm shocked that I would ever have said I didn't like tomatoes or potatoes. What about the foods that I remember REALLY disliking as a kid (and still do), like all types of seafood?! I must have left it off the list back then because of my long-held philosophy that humans should not eat water creatures. I'm not too surprised by the foods I liked: spaghetti and candy (all 'deserts'). I still like both spaghetti and candy A LOT. I've learned how to spell desserts correctly, and I like them a lot too. 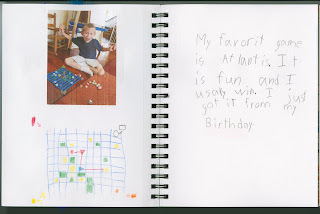 At 7, liked playing Clue and Monopoly, while I did not like Candy Land or 'curious geoge.' I don't remember a Curious George game - it must have been one my younger sister owned and made me play with her. Reading through this makes me realize that Trevor has never played Monopoly, a childhood staple for me. He's always been so interested in word games like Scrabble or Boggle, or puzzle/strategy games like Blokus or Rummikub that we haven't introduced a classic like Monopoly. Time to change that. 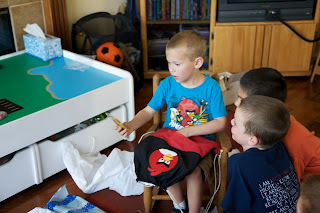 I'm happy to report that Trevor's Angry Birds birthday party was a great success! The only thing that wasn't quite perfect was the weather, as it was 100 degrees for our afternoon backyard party. We ended up moving large portions of the party indoors, alternating things that had to be done outdoors (relay races, piñata, etc) with things that could be done indoors. Here's the birthday boy, waiting for his guests to arrive. 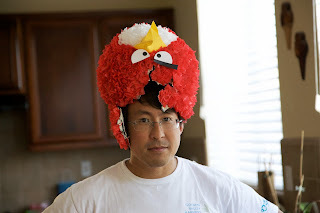 His party hat was so easy to make - we just glued a cut-out Angry Bird face onto a plain red hat. 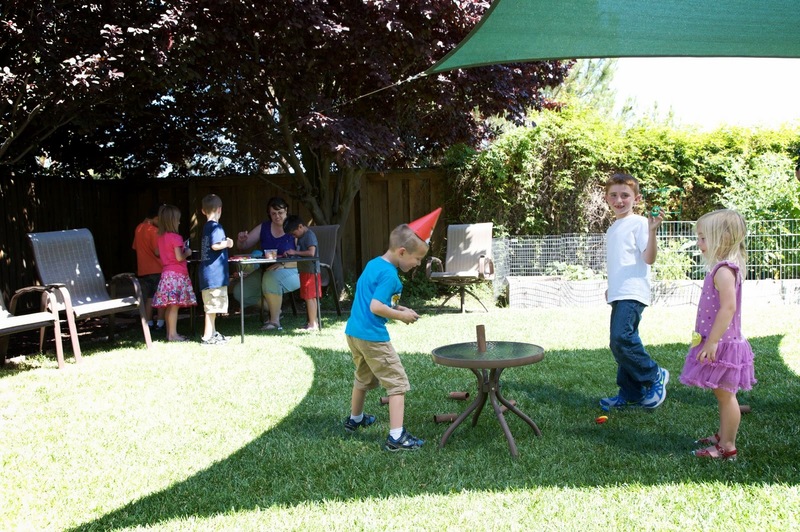 We set up three stations in the backyard: a craft area, a place to play the cardboard tube version of Angry Birds, and a table with Angry Birds Bingo. The kids could choose which they wanted to do and how long to stay at each. Here you can see four kids at the craft table in the back left and three playing live-action Angry Birds. The Angry Birds Paddles the kids made turned out so cute! They had great fun using their paddles to play Balloon Ping Pong. The wind kept the game interesting! 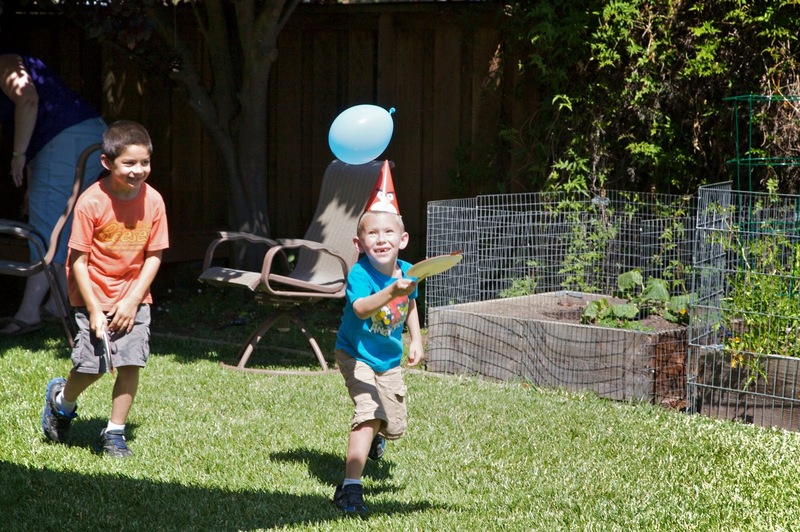 Unfortunately, the balloons kept popping. But by the time the last balloon had popped, the kids were drenched in sweat, so it was time to quiet down a bit anyway. After a brief break for a group picture, I had each child draw a slip of paper from the Blue Bird. It started life as a plastic pumpkin. We spray-painted it blue then glued on a face cut from white and yellow, and orange paper. So easy. Everyone looked at their slip of paper, which had either a red bird or a black bird on them. This divided them into teams. Their job was to use two spoons (either red or black, depending on the team) to transport a nest of golden eggs to an empty nest across the yard. 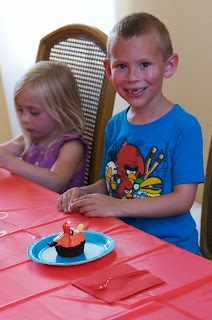 This was a nod to the fact that Trevor turned 7 on the 7th... his Golden Birthday. I wanted to work gold into the party in a way that made sense. The golden eggs were a hit. 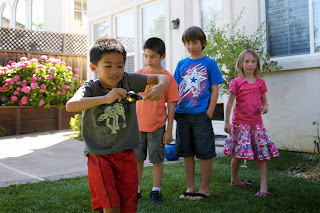 The first challenge was for each person to pick up and transport an egg using only two spoons. The second challenge was for two people to work together to transport an egg- each holding one spoon with their other hand behind their back. 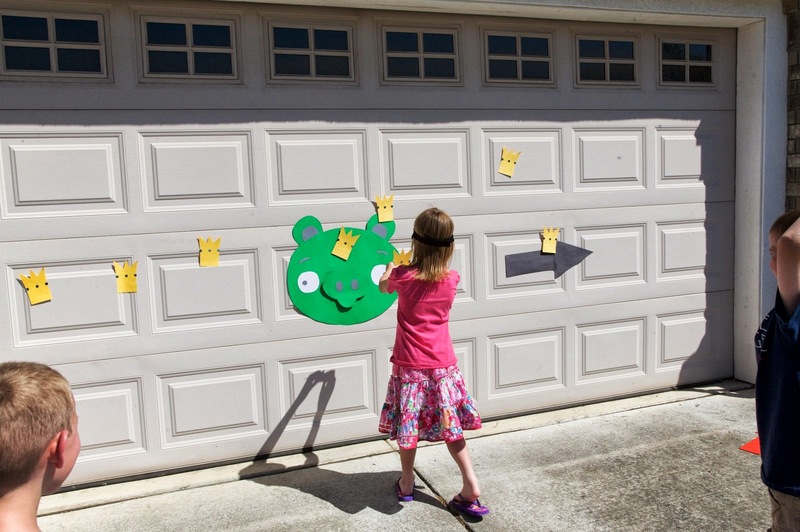 Next, we headed to the front yard to play Pin the Crown on the Pig. It was hilarious. Trevor's crown is the one on the FAR left, nowhere near the Pig! After that, we headed indoors for the Present Game. We played two rounds. 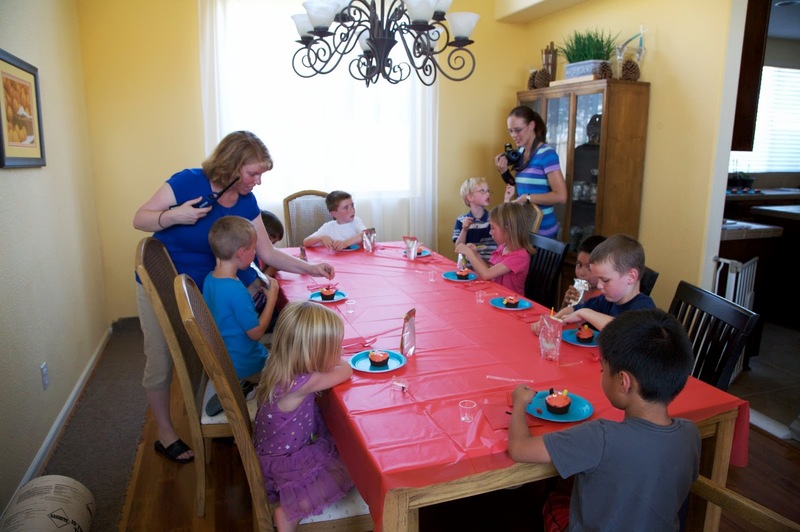 We headed to the dining room to decorate Angry Bird cupcakes. Then we sang to Trevor. Poor guy is still bright red despite being indoors for 20 minutes by then. By the time we headed back outdoors, there was a lot more shade in the backyard and a nice breeze had picked up. Time for the piñata! 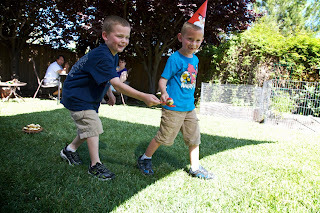 Each child got a turn and we got part way through second turns when the piñata broke. Perfect! After they picked up the candy, they amused themselves by trying on the broken Angry Bird. Steve took this picture of Trevor's godfather. I didn't even see him try it on. Love it! We came back indoors for Angry Birds Pictionary. 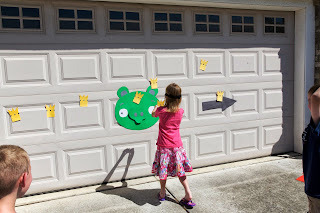 Each child drew a word related to Angry Birds (pig, mustache, slingshot, etc) and the others guessed. They loved it. Finally, it was time to open gifts. Check out the backpack that Trevor's godmother made for him. She said it was her first time doing applique. It turned out so well! I can't wait to see what Trevor picks for next year's theme. I'd love to do a chemistry/Mad Scientist theme, or a Harry Potter theme, or a camping theme, but he's the boss. Of course, that doesn't stop me from subtly (or not so subtly) making suggestions for the next 11 months. I love ice cream, obviously. It seems like just about everyone does, which is why it's such a fun motif for a card. 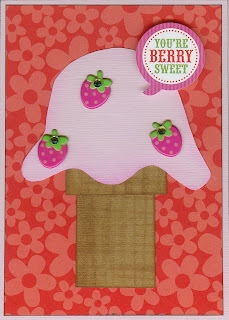 I recently won Doodlebug's new Fruit Stand collection and decided to use it for some ice-cream themed cards. I raided my cardstock scraps for browns, pinks, and whites and got to work. First, I used the edge of a brownrectangular ink pad to create a series of vertical and horizontal lines on tan rectangles to mimic the look of an ice cream cone. I adhered the two pieces to each other, then topped them with a freeform scoop. 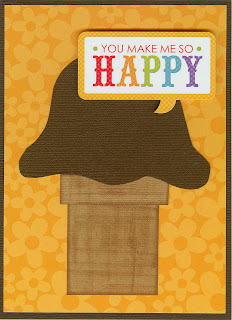 The first card I made was a simple chocolate cone with a colorful sentiment sticker. I paired a vanilla ice cream cone with a bright and colorful floral background. The strawberry-shaped brads are a fun touch. 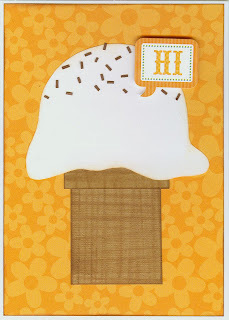 For my last card, I cut tiny slivers of brown cardstock, put dots of glue randomly on the cone, and sprinkled. Each card only took a few minutes to make AND I used up scraps in the process. A definite win! It's time for June's Project 41, my plan to try each flavor-of-the-month at Baskin-Robbins with a different friend as a year-long celebration of my 41st birthday. It's been four months now and it has been awesome. I highly recommend turning your birthday, whatever the number, into a year-long celebration! This month, I asked my friend Justin to join me. I met Justin five years ago when he became the youth director at our church. I hesitated to ask him at first, as this is a really busy time of year for him. Not only is he planning a fundraising golf tournament, VBS, and a Mexico mission trip, but he's getting married in 3 weeks! But he enthusiastically agreed to take time from his schedule to meet me for the flavor-of-the-month. Part of the adventure of Project 41 is that not knowing what the month's flavor will be. Will it be something I don't like? Something I don't expect to like, but end up loving? Will I find a new favorite? Will my friend not like the flavor, or be nervous to try it, or end up loving it? It's all part of the fun! So you can imagine how I felt when I saw that June's flavor was Triple Vanilla.Vanilla? Seriously Baskin-Robbins? Baskin-Robbins says, "We've swirled together Classic Vanilla, French Vanilla, and Vanilla Bean to create a premium new flavor!" I ask again... seriously? So much for adventure. Three vanillas swirled together. Oooh, thrilling! So new! So premium! Justin and I got our ice cream ("2 of the swirled vanillas, please!") and headed out to the courtyard. The time flew by. Before I knew it, it was time to pick up Trevor. Justin and I both enjoyed the ice cream, but there's really nothing to say about it. It was vanilla, vanilla, and vanilla, all swirled together. There was no discernible difference between the three except in appearance. It was tasty, of course, as vanilla ice cream is, but as far as flavor-of-the-month status, it is a flop. This led me to think - what would I have chosen for June's flavor-of-the-month? Well, National Donut Day is in June... how about a chocolate ice cream with maple glazed donut chunks in it? June is also National Candy Month... maybe an ice cream loaded with mini M&Ms, or Nerds, or crushed Smarties? (Or all 3!) Maybe something that ties in to Flag Day or Father's Day. So many possibilities! Who knows... maybe in a future month I'll be facing Salmon Eyeball Ice Cream (any Iron Chef fans remember that?) and longing for the days of Triple Vanilla. Thanks to Justin for joining me for Project 41!